San Diego’s ballot this year – 17 state measures, and 14 local ones if you live in the city of San Diego, plus trivial stuff like electing the leader of the free world – is so big you’ll actually have to fill out two separate ballot cards. For those who mail in their ballots, that’ll mean a regular old 47 cent stamp won’t cover the increased weight. It’ll take 67 cents’ worth of stamps instead. So what happens if too many voters don’t recognize the distinction, and only use a single stamp? Would the ballot come back to them, trying their patience and raising the chances that they say, “Aw, screw it!” and move on with their lives? Turns out, no. The County Registrar of Voters has a standing agreement with the United States Postal Service to make sure every ballot – even those with insufficient postage, or no postage at all – gets delivered, said Michael Vu, San Diego’s registrar. Then the registrar repays USPS the cost of any unpaid postage, out of its overall budget. “We aren’t going to start denying a vote being counted for insufficient postage,” Vu said. But there is one specific complication with mailing in this year’s two-card ballot you should be aware of. If you mistakenly send in just one of the two cards, the registrar will record that you’ve already voted; if you try to return the second card later, it’ll be too late. “If you’re going to fill out both cards, return them in one envelope,” Vu said. All the candidates will appear on the first ballot card, Vu said. The state measures will begin at the end of that card, and continue on with the local measures filling out the second card. So if there’s any increased falloff due to the second card – or because some people mail only one card back – it’s the measures and propositions that would be most affected. Robert Hickey’s rocky relationship with his boss has resurfaced as an issue that could affect his bid to be the next city attorney. A committee supporting Deputy City Attorney Mara Elliott, Hickey’s Democratic opponent, is out with a new ad highlighting the long-running feud between Hickey and District Attorney Bonnie Dumanis. As the ad points out, Dumanis hasn’t endorsed Hickey and she demoted him after he didn’t endorse her 2014 re-election campaign. Hickey had feuded with Dumanis supporters while he was president of the deputy district attorneys union. Two sources close to the Hickey-Dumanis situation last year told me Dumanis reprimanded an elected Republican official for endorsing Hickey. The ad came from a committee separate from Elliott’s campaign. Citizens Opposed to Hickey for City Attorney 2016 is funded so far by a $25,000 donation from the local chapter of the electrical workers union. The ad is on YouTube right now, and it’s unclear how much the committee is spending to broadcast it on TV, if at all. Hickey and a past supervisor have said his demotion couldn’t have been performance-based, and pointed to the fact that he was still prosecuting a murder case afterward as evidence that Dumanis must still see him as a capable attorney. Dumanis issued a statement last year saying there were multiple strong candidates running for city attorney and that she may revisit an endorsement later. With just over a month before the election, and a new ad out highlighting her feud with Hickey, she may be under increased pressure to do so. Hickey advanced through the June primary relatively unscathed as four Democrats battled to join him in the November runoff. “Elliott needs a negative campaign to distract from the fact that she’s never tried a single criminal case, yet wants to oversee an office that handles 30,000 per year,” said Sara Kamiab, Hickey’s campaign manager. One of the many local measures on next month’s ballot, Measure G, asks voters to make some long-term changes to the Citizens Review Board – a city commission with limited authority to investigate police-community issues. The changes would rename the board to the Community Review Board on Police Practices, make clerical edits to the City Charter and require the board look into every officer-involved shooting or death that occurs while someone is in police custody. Other proposed changes didn’t make it into the measure facing voters. An earlier proposal included giving the board subpoena power, so it could conduct its own investigations into incidents, instead of relying on SDPD’s internal affairs investigations, as it does now. It also would have given the board independent legal counsel, instead of relying on the city attorney’s office, which also represents the police whose behavior the board is reviewing. The city’s budget now includes $25,000 for independent legal counsel for the board, but that’s only used if the board’s deputy city attorney recuses herself due to a specific conflict of interest. Both Hickey and Elliott now say they would support a ballot initiative in 2018 that permanently changes the board’s legal counsel to come from outside the city. Elliott said the city currently follows ethical guidelines that limit any conflict; the office builds a metaphorical wall between the attorney who represents the board and whoever represents officers. “But it is up to the city attorney to make sure the public is comfortable with how we do business, so I would support a charter amendment,” she said. Hickey went a step further. He said he’d also support a change that would give the board subpoena power in its investigations — meaning it could require officers to testify on an incident, though officers could still invoke the Public Safety Officers’ Bill of Rights to keep from doing so. Hickey said he’d suggest the city study the strengths and weaknesses of the change, and would be prepared to support it if its deemed an improvement. Elliott said there’s no need to make that change. Just over a week ago, we hosted a full day of speeches, interviews and public debates on some of the biggest issues facing voters in November. Video of many of those events is now online. The most heated panel of the day was the debate on Measure K, which would force all city elections to a November runoff, instead of allowing them to be decided in June if one candidate gets over 50 percent of the vote. A companion proposal, Measure L, would similarly put local ballot initiatives on the November ballot. Both sides got plenty fired up over the issue as I tried to keep the peace. Check it out here if you’re undecided and want to understand more about what’s at stake and who supports each side. You can also watch a lengthy, substantive exchange over Measure A, a proposed sales tax hike to pay for regional transportation and infrastructure improvements. No matter your political leanings, you should also watch both of our keynote speakers. Reihan Salam, editor of National Review, gave an insightful Q-and-A on the way forward for conservatism in the face of the country’s demographic shifts. And Black Lives Matter organizer DeRay McKesson shared his observations on the relationship between police and communities and his process advocating for reform. • During our weekly podcast, Scott Lewis and I have for weeks been conducting what we called “The Faulconer Watch,” keeping tabs on when and whether Mayor Kevin Faulconer would weigh in on Measure C, the Chargers’ proposal to raise hotel taxes to build a downtown convadium. And now our watch has ended. 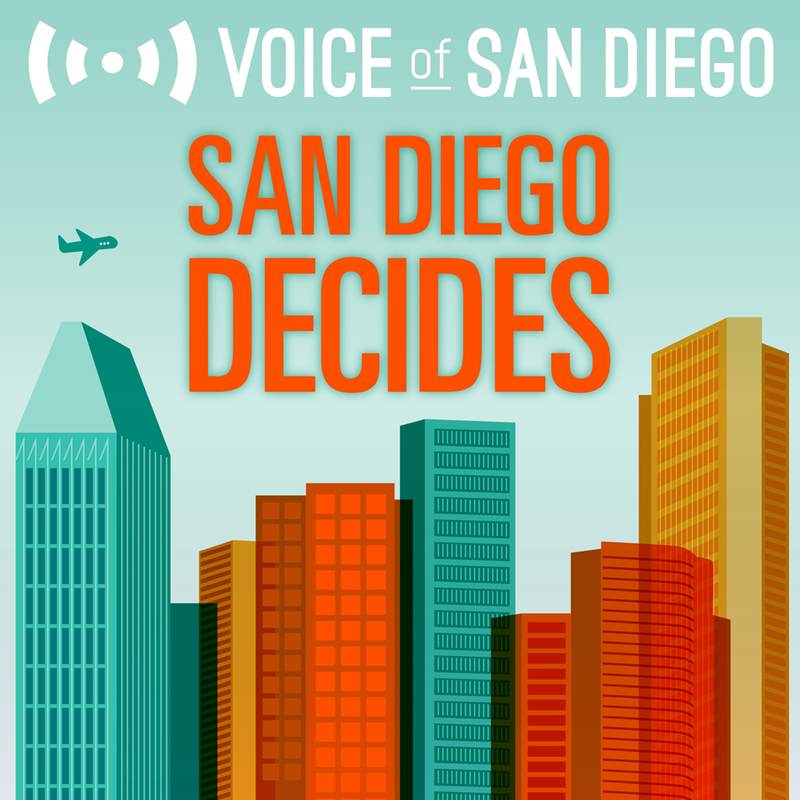 Faulconer told the San Diego Union-Tribune Sunday night that he supports the measure. • In other endorsement news involving the U-T, the paper endorsed Hillary Clinton for president last week, the first time in the paper’s 148-year history it’s advocated for a Democrat. • The two candidates vying to be Encinitas’ new mayor joined KPBS’s “Midday Edition” last week to discuss the campaign. CouncilwomanCatherine Blakespear is held in high regard among local Democrats. Paul Gaspar, a Republican and local businessman, is married to the city’s current mayor, Kristin Gaspar, who is trying to knock Dave Roberts out of his seat on the county’s Board of Supervisors.